The crew of the USS Enterprise encounters an ion drive vessel, something Scotty finds particularly interesting. Soon though, a strange woman from that ship transports herself onto the bridge and renders everyone on the Enterprise unconscious. She slips deliberately among the crew until she finds Spock. Mysteriously, she presses her hand against the first officer's head. When the crew awakens, they find that Spock is missing from the bridge. Dr. McCoy urgently calls Captain Kirk down to sickbay, where he finds Spock on a biobed. McCoy struggles to explain that, somehow, Spock's brain has been surgically removed, leaving the body alive but on full life support. Kirk proposes to find Spock's brain, but McCoy warns that the unique properties of Vulcan physiology give them only 24 hours to reintegrate it into the science officer's body. The Enterprise uses the bulk of those hours following an ion trail to the Sigma Draconis system. Ensign Chekov places a schematic of the system on the viewscreen, pointing out that there are three class M planets. With only eight hours remaining to save Spock, Kirk has time to visit only one of the planets before Spock's body expires, so he holds an informal staff meeting on the bridge with Chekov, Sulu, and Uhura to arrive at a decision. None of them seems capable of supporting interstellar flight, but Uhura finds large, regular energy pulsations on the otherwise glaciated and pre-industrial Sigma Draconis VI. The unlikely world thus becomes Kirk's best hunch. If he is wrong, Spock will die. Kirk, Scotty, Chekov, and two security officers beam down to the frigid surface. There, they detect five large, primitive male humanoids. Following an ambush, Kirk subdues one of the humanoids with his phaser. The humanoid, a Morg, is confused because Kirk and Scott do not seem like "the Others", whom he describes as being the givers "pain and delight." Kirk is puzzled because the Morg does not understand what it means to have a mate nor does he seem to understand exactly what a female is. "It might be a long wait. We may as well be comfortable." Chekov finds evidence of an underground city with his tricorder. Scott finds food and weapons stored in a cave, but Kirk discovers a sensor and surmises that the cave is a trap the Eymorg use to capture the male natives. McCoy beams down with Spock, whom he has fitted with a remote-controlled device to substitute for his brain. They allow themselves to be captured. Chekov and the Enterprise security officers remain above ground; Chekov uses his phaser to heat a rock to help them stay warm, since Kirk and company may be a while. In the underground city, they encounter Luma, one of "the Others" – a race of beautiful females, the Eymorg, who live in comfort below the surface of the planet, but have the minds of children. Captain Kirk finds that he is able to establish contact with Spock's brain by using his communicator. Spock reports that he is well but that he does not know where he is. They find the woman they saw on board the Enterprise immediately before Spock's brain was removed, who renders them unconscious by pressing a button on a device located on her wrist. They are taken prisoner. When the landing party comes to, they find that they have been outfitted with silver belts that have large, round green devices at the abdomen. Kirk demands to know what has happened to Spock's brain, but the Eymorg do not understand what a brain is or what is the Enterprise. Finally they understand that the "Controller" the Eymorg speak of is Spock. It seems that these women have somehow connected Spock's brain into their computer and that his brain is responsible for running their expansive underground dwelling because they, as a race, have long forgotten how to take care of themselves. Having been left alone, McCoy, Scott, and Kirk incapacitate the guards. Kirk speaks to Spock using the communicator. They inform him that his brain has been removed and it is being used as some sort of controller. Spock reports that he has a body that stretches into infinity and his medulla oblongata seems to be breathing, pumping blood, and maintaining temperature. Spock suggests that the project to restore his brain might be impractical; he would trust McCoy to remove a splinter or lance a boil, but the knowledge to replace his brain does not exist in the universe. Kirk, however, insists that if the knowledge exists to remove his brain, there must be knowledge to put it back. He instructs Spock to send out a signal so that they may find where he is being kept. Spock complies. As they make their way to the chamber, Kirk asks about the belts. 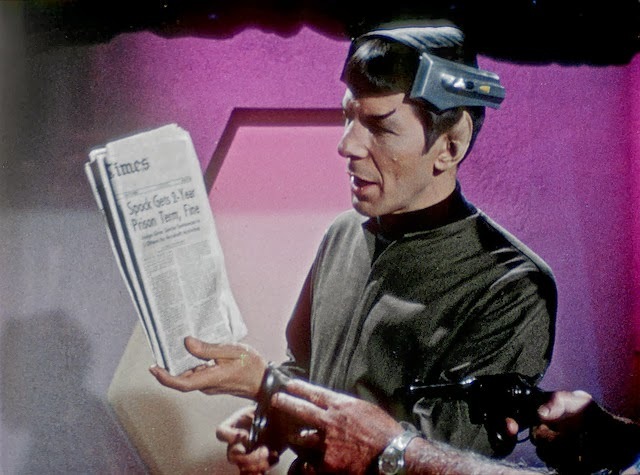 Spock accesses the information: one must press a red button on a bracelet in order to release the belt. They enter the chamber where Spock's brain is kept, but an Eymorg is in the chamber and activates the pain belt. Kirk uses the remote control device to use Spock's body to grab Kara's bracelet and press the red button, releasing the belts. With the crew freed, Kara pleads that Spock's brain must remain connected or their civilization will die. Kirk tells Spock that he is in a black box connected by light rays to a control panel. He wonders if the sensations he is feeling means that Spock is recirculating air, running heating plants, and purifying water. Kirk asks Kara how she was able to remove Spock's brain by placing on her head a device known as the "teacher". They place it over her head, and she suddenly speaks with erudition. She admits that she does have the knowledge, but she also now knows to use a phaser, which she points at Kirk. It is set to kill. McCoy endures the pain of the Teacher's "lessons"
Kara and Kirk debate over the proper disposition of Spock's brain. Scott pretends to faint and distracts Kara; they obtain the phaser from her. She says that the teacher will provide knowledge for three hours, which McCoy says would be just long enough to effect the transplant, but she refuses to perform the operation. McCoy points out that he has medical knowledge and should be able to use what he already knows and retain the knowledge. McCoy places the teacher on his head and receives the knowledge; when he recovers, he says "Of course; of course. A child could do it. A child could do it." McCoy begins quickly restoring Spock's brain, using the same knowledge originally used to remove it. However, after a time, McCoy begins losing the knowledge he has gained. He exclaims in despair, "I am trying to thread a needle with a sledgehammer!" Drawing on his own skills with only a few minutes left, he connects Spock's speech center, allowing Spock to speak. Spock then assists McCoy in completing the reconnection of his brain. "I'll never live this down," McCoy says, "this Vulcan is telling me how to operate." Upon his restoration, Spock makes a speech that explains the history of this retrograde civilization and the split of the sexes. McCoy then laments, "I should have never reconnected his mouth." "Well, we took the risk, doctor," Kirk jokes. "What if you guess wrong, captain?" "If I guess wrong, Mr. Spock is dead. Spock will die." "Call Chekov and tell him to send my stomach down." "Brain and brain! What is brain?!" "Pain and delight, he said up above." "I'm sure you noticed the delight aspect." "Yes, I certainly did notice those delightful aspects." "This fellow is keeping us from our property." "Well, isn't there a way to correct that situation?" "While I might trust the doctor to remove a splinter or lance a boil, I do not believe he has the knowledge to restore a brain." "The Controller is young and powerful. Perfect!" "No one may kill a man. Not for any purpose. It cannot be condoned." "A child could do it." "I should have never reconnected his mouth." "Well, we took the risk, doctor." Spock's brain was taken while he, Kirk, and McCoy were exploring the surface of an asteroid. The antagonists were from the planet "Nefel," and were known as the "Nefelese." Their leader is a male named "Ehr Von." Also, there is no mention of the "Teacher." When Kirk contacts Spock's brain, he instructs the brain to go into the slon porra, the Vulcan state of complete mental control. McCoy received no transfusion of any special surgical knowledge except for a study of the planet's advanced surgical techniques. Only when combined with his existing surgical knowledge is he then able to perform the surgery. After McCoy completes the brain implant surgery, Spock experiences several side effects from McCoy having reversed the connections of several nerve endings, causing Spock to, among other things, laugh when he wants to sneeze. He is, however, able to restore the errors with his own mental disciplines. In Up Till Now, his 2008 autobiography, William Shatner jokes that the plot of this episode is a "tribute" to NBC executives who had slashed the show's budget and placed the show in an undesirable time-slot. This is the only episode title of the original series that includes an Enterprise crew member's name. Characters that received a title mention in later series include Q with eight titles, Data with three, Julian Bashir with two, and one for each of Deanna Troi, Quark, and Tuvok and Neelix (as Tuvix). This was the last episode to be directed by regular Trek director Marc Daniels. Daniels was unhappy with the budget cuts the series suffered for the third season and the direction it was taking overall, and declined to come back to helm more episodes. (These Are the Voyages: TOS Season Three) However, Daniels later wrote the episode "One of Our Planets Is Missing" for Star Trek: The Animated Series and directed the pilot Planet Earth for Gene Roddenberry. The score for this episode (by Fred Steiner and recorded on 26 August 1968) was re-used in later episodes during the playback of Kirk's final message in "The Tholian Web" and Kirk's return in the transporter room in the same episode, for example. The battle music from this episode later scored Kirk and Kang's sword fight in "Day of the Dove". This is the first and only episode besides the first pilot where characters walk in front of the main viewscreen showing a moving starfield. This was achieved by using rear projection instead of the usual post-production matte used in viewscreen shots. The authors of the guidebook Star Trek 101 applied this episode's title to the "Spock's Brain" Award, given to the worst episode of each series as voted on by fans. The recipients were TAS: "The Lorelei Signal", TNG: "Genesis", DS9: "Profit and Lace", VOY: "Threshold", and ENT: "These Are the Voyages...". Westheimer Effects created the unique glaciated planet seen from orbit in this episode. Matt Jefferies designed the "control device" used to pilot the brainless Spock, later identified as a neural stimulator. Sketches depicting several design variations of this prop, including an optional variant with antennae and a chest band variant (reminiscent in design to the pain bands), appeared in the Star Trek: The Original Series Sketchbook (p. 53). Footage of the Eymorg's computer displays in operation is recycled footage from "Assignment: Earth" and "The Paradise Syndrome". The jumpsuit that Leonard Nimoy wears on the planet's surface appears to have been the same one he wore in "This Side of Paradise", complete with black shirt. This is the only instance of Sulu recording a log entry while in command during TOS. In his log entry, he refers to Sigma Draconis VI as Sigma Draconis VII, a mistake Kirk made in an earlier log entry as well. The lexicon in the Star Trek Concordance also makes note of this oversight in dialogue. Kirk also lists the wrong "stardate" at the beginning of Act Two as 4351.5, when it is supposed to be 5431.5. This marks the third of five times that Sulu is seen in the captain's chair while temporarily in command. The first time happened in "Errand of Mercy", the second in "The Enterprise Incident". The last two occur in "The Lights of Zetar" and "The Savage Curtain". The novelization of this episode explained that McCoy was the only person who could use the Great Teacher since he had pre-existing medical knowledge, showing why the other members of the crew could not use the Great Teacher to assist in healing Spock. The remastered version of "Spock's Brain" aired in many North American markets during the weekend of 9 June 2007. The episode marked several script-appropriate departures from the original broadcast version. Given the generic design of the original ion starship, it would seem unlikely that Scotty could have recognized its propulsion system just by the hull design. The remastered version thus gives the hull a unique, easily identifiable shape. "In the episode "Spock's Brain" the ion propulsion spacecraft spotted by the Enterprise in 2268 certainly impressed Scotty with its design and technology. The comparison between the original and the remastered version provides two totally different looks, with styles defined more by the contemporary technology. The original is a standard rocket-shaped configuration. At the time, "spaceships" tended to fall into one of two classic looks, the other being the flying saucer.The new, remastered version of the ion propulsion craft is smaller and more utilitarian, reflecting its single-person occupancy, and it ditches the unnecessary missile/rocket configuration. The design also reflects more modern-day ion propulsion prototypes."